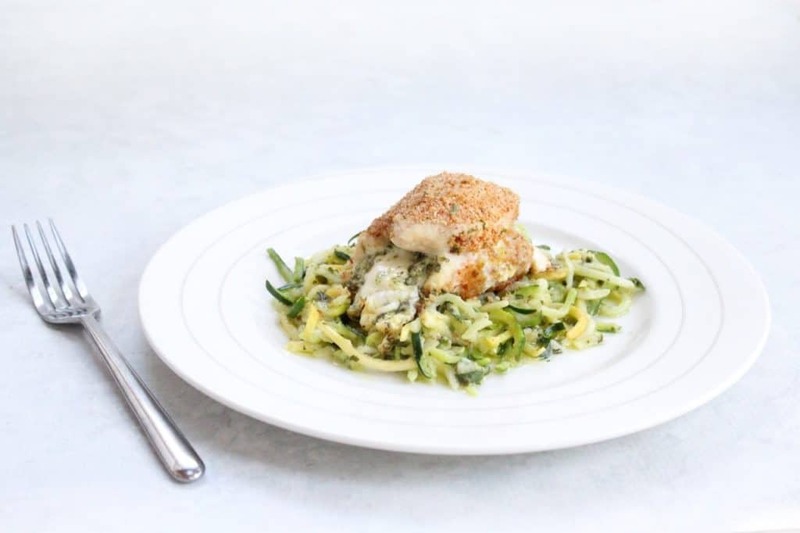 A St. Patty’s day recipe from this Italian nutritionist! Happy St. Patty’s Day! How will you celebrate? Plan on drinking that traditional green beer? While fun, it's probably not gluten free or free from artificial food dyes either. Instead here is a fun way to serve up green that is healthy for the whole family! Although we did enjoy our time traveling in Ireland, we do have to be honest and admit that, in our opinion, the food in Italy wins hands down. So, for this Irish celebration we are suggesting you serve up tasty Italian food that just happens to be green. The meal is delicious and sure to be a hit with all your little leprechauns. Step 1: Choose your Pesto – dairy free or Traditional Italian style? Combine the basil, cheese, pine nuts, garlic, and salt in a food processor and blend until evenly and finely chopped. On a low setting, slowly add the SKINNYFat until the sauce has a thick, even texture. Combine all of the ingredients in a blender or food processor and blend or process until smooth. 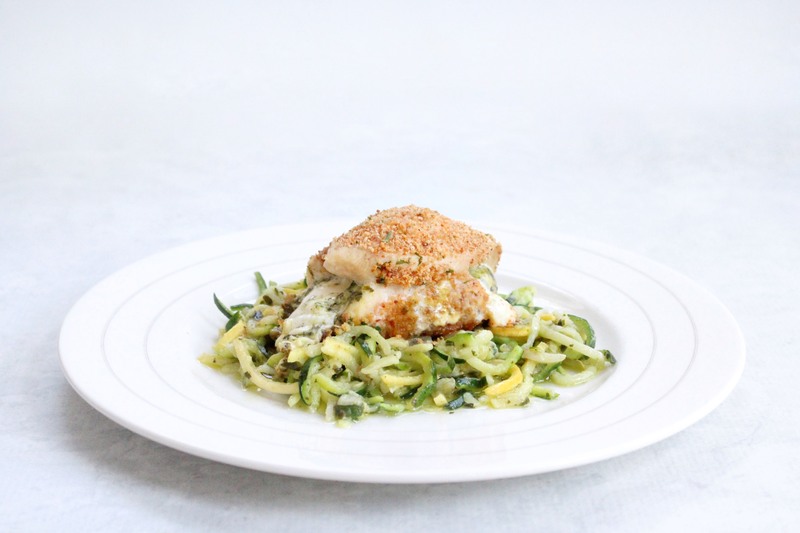 Prepare the zucchini into noodles using either an inexpensive julienne peeler or vegetable mandolin/spiral slicer. You can find our favorite picks here. We love the long zughetti ribbons that the slicer forms—You can even wrap them around a fork like the real thing. A small investment with a ton of great uses. 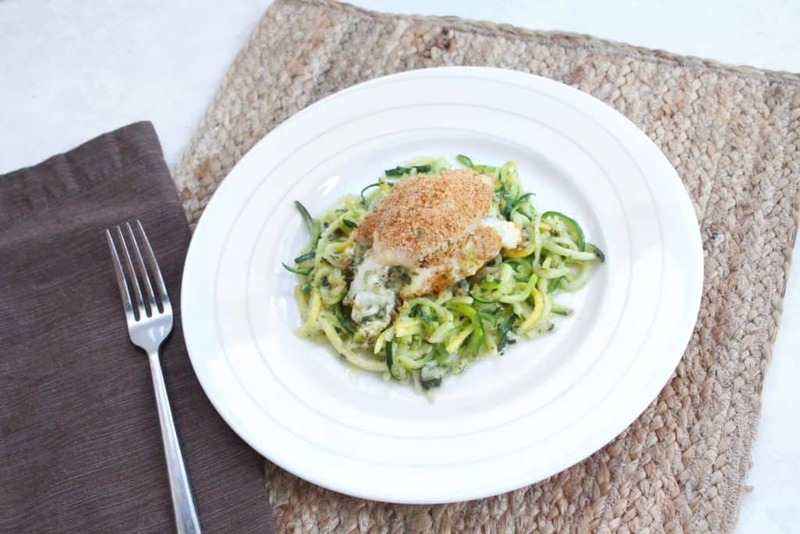 Put the zughetti ribbons in a colander and toss in with 2 teaspoons of unrefined sea salt. The salt with help pull the water out of the zucchini and make them even more noodle-like. Place the colander over a bowl to catch released water. Let stand for 20 minutes. Rinse the zughetti well. You don't want salty noodles! Pat dry and set aside. Heat oven to 350 degrees F. Butter a cookie sheet and set aside. Flatten each chicken breast to about a 1/4 inch using a meat mallet (tenderizer) or rolling pin. Top each with mozzarella cheese (optional) and roll up the chicken and secure with toothpicks. Place the beaten eggs in a pie plate or shallow dish. In a medium bowl, combine Italian “bread” crumbs, Parmesan cheese, salt, and pepper. Dip each chicken breast in the eggs and then into the cheesy Italian Bread crumb mixture. Coat well and discard extras. Place chicken on the prepared baking sheet. Bake 40-45 minutes or until chicken is no longer pink in center and the chicken is golden brown. Add the pesto and dry zughetti noodles to the large skillet. Toss and coat the noodles and allow to cook on medium heat for 2 to 3 minutes. Serve the coated pesto zughetti underneath the chicken rollup and enjoy the Italian tribute to the Irish holiday.